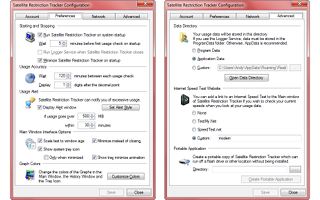 Satellite Restriction Tracker is free software supported by donations, not advertisements. 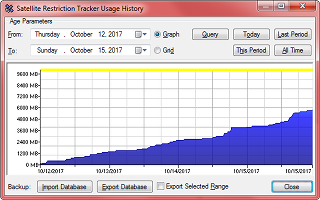 Satellite Restriction Tracker for WildBlue and Exede Internet customers: Log and graph your bandwidth usage, keep track of your limit. 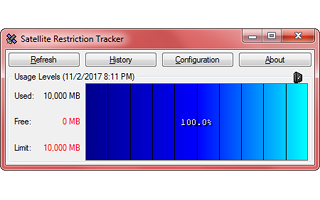 The Satellite Restriction Tracker program automatically grabs and stores your current bandwidth usage every fifteen minutes, showing only a small logo in your system tray while running. 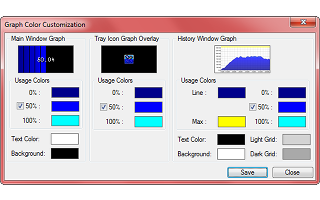 When you open the program, you'll see a graph of your current usage, as well as the hard numbers and the time the usage was grabbed. Opening the History window will let you list your usage given all past data, displaying it in easy-to-read graphs or grid representations, helping you map out your bandwidth usage and estimate when your usage values will drop. The graphs can be customized and the program's features are all easily changed from a helpful Configuration window, which also allows you to set up alerts when your usage climbs too fast. Satellite Restriction Tracker's History window also lets you export data in either XML or CSV formats, so you can view your history through spreadsheet applications or other tools, or to help you send your usage data to your provider or other users. You can also backup and restore your entire history using the custom Satellite Restriction Tracker ".wb" format. This utility should function correctly with any ViaSat account, including Exede, Exede Business, WildBlue, Dish, DishMail, DirecTV, Satellite Internet Co Exede Resellers, Kit Carson Electric Cooperative, ENMR Telephone Cooperative, Advanced Communications Technology, NOVEC Energy Solutions, Northland Connect Broadband, Otsego Electric Cooperative, Southeastern Indiana Rural Telephone, Houston County Electric Cooperative, NRTC Rural Broadband, Flint Hills Rural Electric Cooperative, Ouachita Electric Cooperative, Boone Electric Satellite Systems, Mille Lacs Energy Cooperative, Escambia River Rural Services, WINN Telephone Company, Cooperatives ONE, Kiamichi Electric Cooperative, KMTelecom, BCREMC Net, TC3 Telecom, Central Oklahoma Telephone Company, and Nelson Cable accounts. Updates are provided regularly to ensure you always have access to your usage data. What do you get if you multiply ten by eight?